By: Shawn C Baker on 30/06/2013. It’s still too early to say where exactly this book is going, but here’s a spoiler-less set-up to wet your appetite (as if Murphy and Snyder’s names weren’t enough to do that! ): Dr. Lee Archer is a Cetologist that specializes in Whale and Dolphin vocalizations. She is approached by an Agent Cruz of The Department of Homeland Security to lend a hand with a recent mysterious recording they’ve made of something in the Ocean. Dr. Archer and the Department have some history – none of it good from the way things are hinted at, and although skeptical at first something from her past drives her to accept Agent Cruz’ invitation and accompany him to an base camp that, to Archer’s surprise, ends up being on the Ocean’s floor. Here she is introduced to a team comprised of specialists from other, related fields and the Agency’s secret is revealed. But I’m not gonna go there. Although I’ve left the juiciest bit of The Wake’s set-up out of this I’ll say that both the writing and the art is excellent, as you’d no doubt expect from a team-up of this caliber, with Matt Hollingsworth‘s colors and Jared K. Fletcher’s letters adding the final, perfect touch to the moody, almost Cameron-like tone. And the research the creators must have done for this is no joke with some of the science afoot, and thus we have some great scaffolding upon which they’ve begun building their story – a story so epic that although the sequences I’ve described above take place in what appears to be present day, issue one begins two hundred years in the future and enigmatically introduces us to a woman and a bio-electrically enhanced dolphin (or something of that nature) who are on the run from a flood traversing what looks like NYC – a flood which incidentally may be bringing with it something decidedly more sinister (see pic). Conversely, issue one ends with a single page set 100,000 years in the past and issue two begins with a similar page but this time 5.1 million years ago. I don’t know what Snyder and Murphy have planned, but as you can tell, it’s BIG and it spans the enormity of time itself. These are the kinds of attributes that have me rabidly anticipating the next issue of The Wake – a book that has the makings of a pretty damn iconic comic book legacy. And honestly, I’m not just saying that because I’ve grown to LOVE the dauntingly polished but still inherently ‘indie’ feel to Murphy’s art – art that once again contains some endearing little nods, like Dr. Archer’s Flak Jackets cap. No, it’s not just the art, it’s the symbiotic feel of what the best comics do so well, that extra-sensory experience of words married to pictures in exactly the right way that lends for such a unique and rewarding experience. 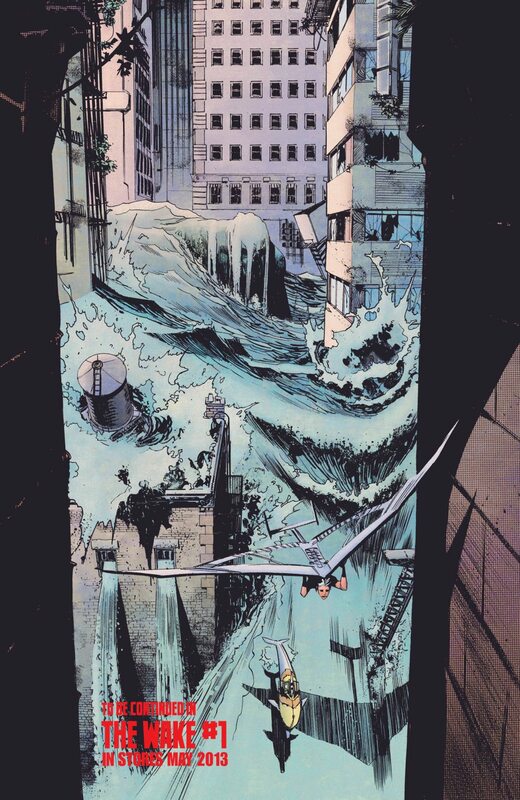 An experience that in this instance has me thinking The Wake is probably the most compelling new limited series (ten issues) I’ve read since Punk Rock Jesus. Issues one and two of Scott Snyder and Sean Murphy’s The Wake should still be on the stand at your local comic shop (they are at The Comic Bug). Issue three has a solicitation date of July, 31st.